Why Munich, you may ask. 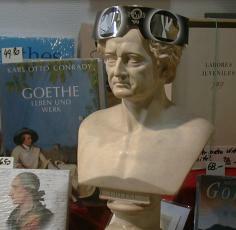 Well, we are not into Druids, and since starting a German language class I had wanted to visit Germany again. The NASA experts were predicting a 60% chance of good weather there compared to a 40% chance in Cornwall, which helped justify our decision, as did the favourable currency exchange rate. Little did we know that the area of Munich where we had decided to stay was packed with computer, electronic and photographic shops - oh so tempting to spend those Deutsch Marks! 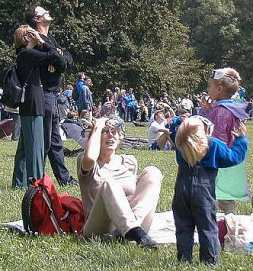 There was quite a build-up to the event in Munich, including easy availability of those essential eclipse sun-glasses. Alongside eclipse-themed adverts and window displays, notices began to appear in shops begging the understanding of their customers for closing during the eclipse period. The day itself started bright and sunny, with fluffy clouds in the sky, but the forecast was not good. This was unfortunate, as some 250,000 extra visitors had arrived in Munich just for the eclipse. However the city is big enough to accommodate the number without problems. There were many special venues on the day - Marienplatz (the town square), the Olympic stadium, the Deutsches Museum - however we decided to join the folk flocking to the huge Englischer Garten park, the largest city park in Europe. There may well have been hundreds of thousands of visitors present, but the gardens are huge and didn't seem at all crowded. 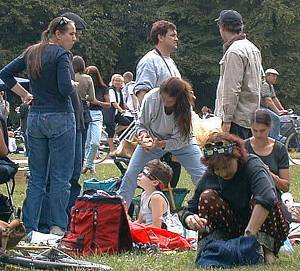 All sorts of people were there - locals and visitors, young and old, office workers and pensioners, amateurs and experts.. For some, setting up their equipment was most important; for others the rituals of an outdoor picnic were the order of the day! Everyone seemed to be well informed and careful to use the proper precautions when looking at the sun. Once we were some way into the eclipse, particularly as the light level dropped, it would have been easy to assume that it was safe, whereas the exposed parts of the sun's disk were still as bright as ever. A really good way to view the partial stages is to project the image onto white card, and the small binoculars we had proved ideal for this. A tripod would have helped here though! Starting to regret my lack of equipment, I managed to use some of the material from a spare pair of eclipse sun-glasses to make a last-minute neutral-density filter for my camera, so that I could take a few pictures myself. There was a growing sense of theatre as the crowds spontaneously applauded the sun appearing from the clouds. Sudden heavy showers brought boos and an unfurling of umbrellas, whilst others rushed for the shelter of the trees. But even during the clear periods it was gradually becoming darker. Initially I only really noticed this when I compared the brightness of my camera display with the ambient lighting. The light then took on a sort of fluorescent quality - perhaps caused by a colour temperature shift towards the blue end of the spectrum rather than the reddening that we normally associate with a sunset. Darkening increased rapidly. 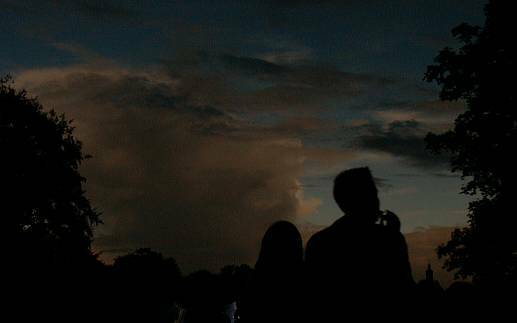 Although the clouds had returned, the beginning of totality brought a huge burst of applause and the inevitable camera flashlights followed by a hushed quietness, everyone suddenly somewhat overcome by the moment. I really can't imagine what the reaction would have been had we seen the sun's corona and prominences. As predicted, the light level at totality was really dark, being well past twilight levels. It wasn't completely black, but any photograph would normally have required flash. Without flash, the photo below captures the effect quite well. As totality ended, a brightening could be seen towards the west, which rapidly came towards us and restored a semblance of normal daylight, albeit at a much reduced level. More applause for daylight returning, as many people began packing up, pleased that the homeward trek, at least, would not be in the rain. But I had the distinct impression that the crowds were quieter - having witnessed an event of a lifetime. 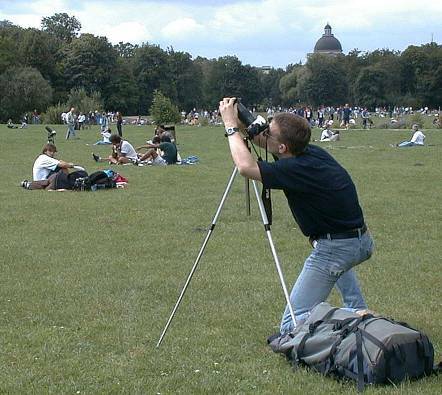 For others, there was equipment to check, and some folk would want to stay longer to get those pictures of the moon gradually leaving the sun's disk. So what happened with my photos? I was fortunate in having a digital camera, as I could therefore check results immediately. With the improvised filter, I needed to use spot metering and underexpose by two stops to get the results shown below, which give a good impression of what happened. The lens was a 230mm (equivalent) focal length, with a typical exposure of 1/100s at f/12. The times are approximate (the camera clock isn't accurate) and are in GMT. Would we do it again? You bet! I really would like to see the effects at totality as I'm sure that even the excellent television pictures we later saw don't capture the moment. Would I take a better camera and try and do more photography? That's a difficult one. 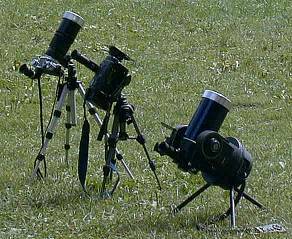 Perhaps an eclipse may be best enjoyed by the majority, and recorded in detail by the professionals! I also made some observations using orbiting weather satellites showing the moon's shadow, and these are written up on this Web site. All photographs Copyright � David J Taylor, Edinburgh 1999. Permission to reproduce is granted providing my name is credited, and my full home URL (http://www.satsignal.eu) is mentioned.